How to market an event? 35 tips to market your event for FREE! 35 Tips to market your event for FREE! Marketing an event to success is one of the most critical parts of an event planning. Digital marketing channels offer tremendous opportunities. However, the conversion of paid marketing channels is very low which further impacts the budgeting. 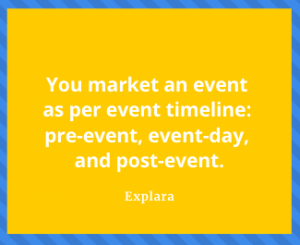 In this post, we will walk you through 35 tips to market your event for free. 3 Ps for your events! Product: Your event has to have a unique concept/offering in a competitive event space. Attendees are looking for unique benefits, such as learning new things, having a great time, or meeting fellow attendees or simply having a great time. Identify this in clear ROI for the participants /attendees, and you have found your perfect event as a product! Price: Analysing your prospective participant demographics, you can easily arrive pricing. However, your event must make money for you or cover your cost, therefore balance this to lay out clear pricing. Place: That’s Location /Venue for you! This could make or break your event. Choose your event location to match your audience profiles and event/conf theme! A fantastic ‘right’ location goes a long way adding to your marketing messages/word of mouth! Before you push the event ticketing/registration to live, build up your website with right content much ahead to build organic traffic. 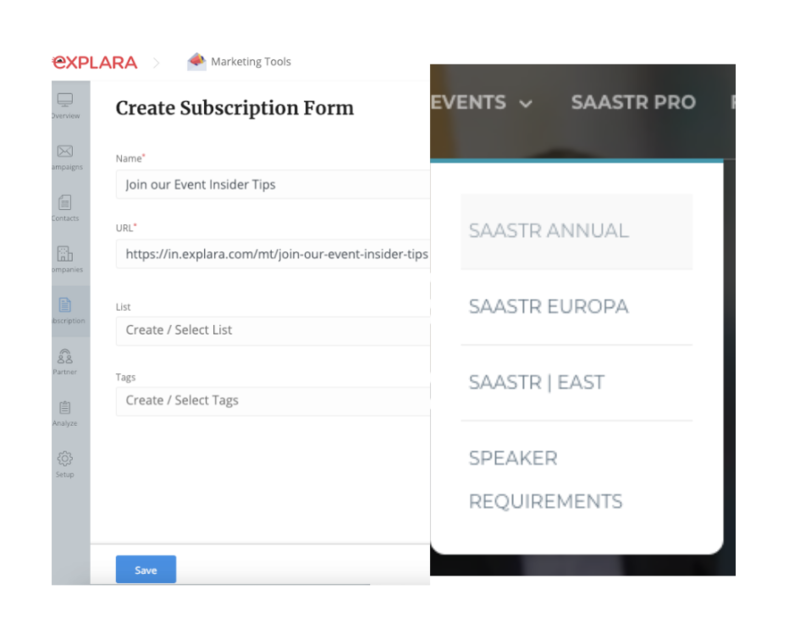 With Explara, you can create your event website live and add SEO keywords and meta. Along with SEO, build your website much ahead of time to raise awareness and point of reference for your event. 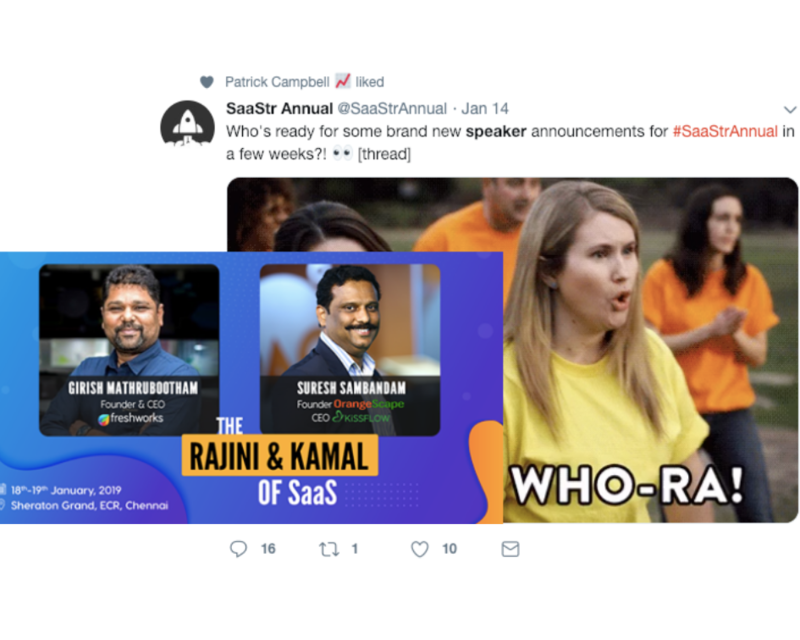 Have you seen how SaaStr keeps all their upcoming events? If you are hosting a B2C event, in that case too your pre-event website is must to gather interest. Allow visitors to join in your newsletter to stay updated on announcements, ticket sales, and insider tips! Gain as many visitors subscription as you can. This is your rich database with zero investment! I recommend you to post new blogs twice a week until the 12 hours leading to the event day. Host your blog on own WordPress/Ghost Blog CMS to retain your traffic, and monetize to your event website. Invite Thought leadership blog from your community, and this will influence readers to share/generate interest. Invite guest authors (speakers, previous event attendees or industry experts). This will further add to your SEO/inbound marketing. Use content scheduling tools like Buffer /SocialPilot to post your blogs and/or repost. Now that your event registration/ticket sales are going live activate your campaigns (free of course). 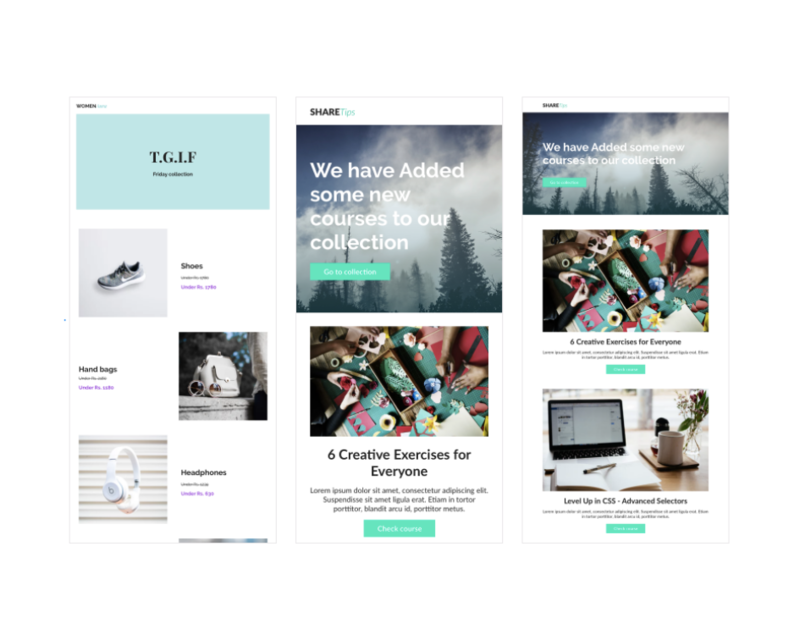 We recommend you to keep building your newsletter list from your event website, blog and engage the audience in a personalized email once in week/10 days until the 12 hours leading to the event day. With Explara Email Campaign, you can design and send engaging email contents to your own database/list subscriptions. Engage your past event attendees. This is the most missing piece I observe among event host that they don’t reach past event attendees. 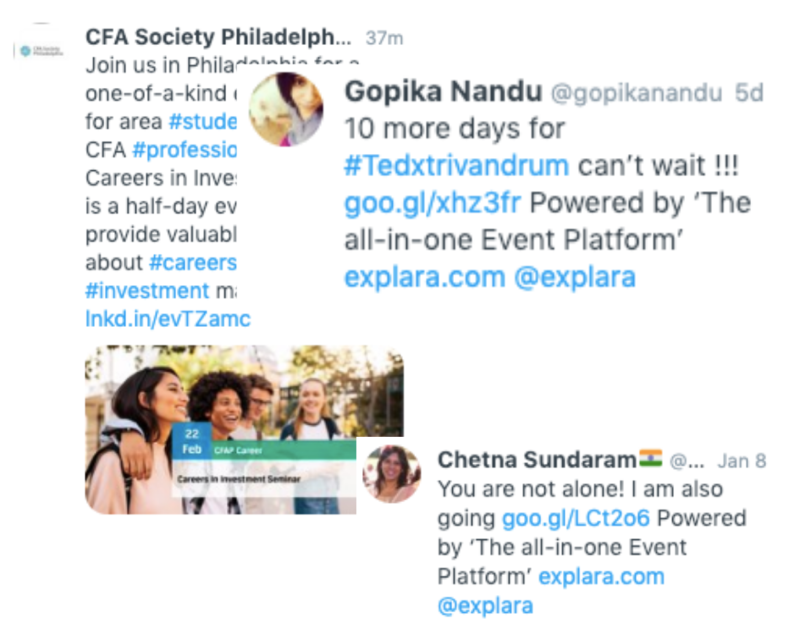 As long as you are not spamming them, you can contact such attendees to build up word of mouth, share discounted pricing, ask them to recommend the upcoming event and ask them their suggestions. If you are using an XLS or CSV file, you have a tough job to merge, email and track. Not very efficient. 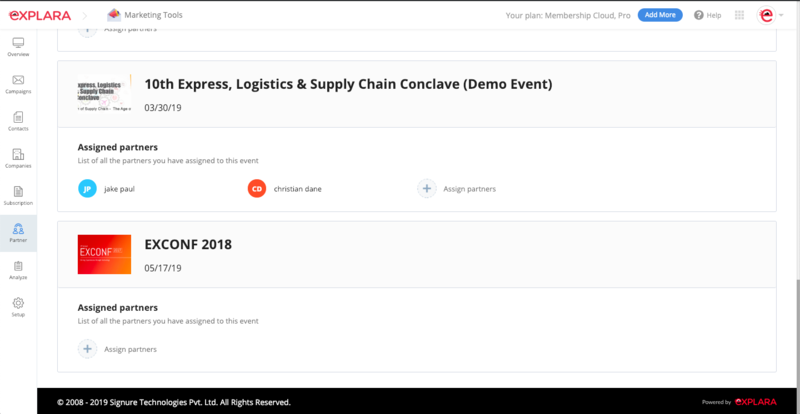 If you are using Explara, it has a built-in mechanism to let you import all ‘your’ past event attendees to invite them to your current events. You don’t have to do anything. All done for you! If you use CRM like Zoho, Freshsales, Hubspot, etc. to manage past event attendees, you can engage email campaigns to engage past event attendees. This costs Zero. And, you can build an authentic community for your events! I recommend you to build a community for your events! Every time, you host an event, you have an opportunity to build a long relationship with your participants. How about hosting a community membership and allow attendees to join as a member for free if they buy a combo package (Event Full Access + Membership vs. Event Full Access). This will establish you to host micro-format events and help you to build this audience for your future event growth. With Explara, this is doable in 1-click event registration to membership. 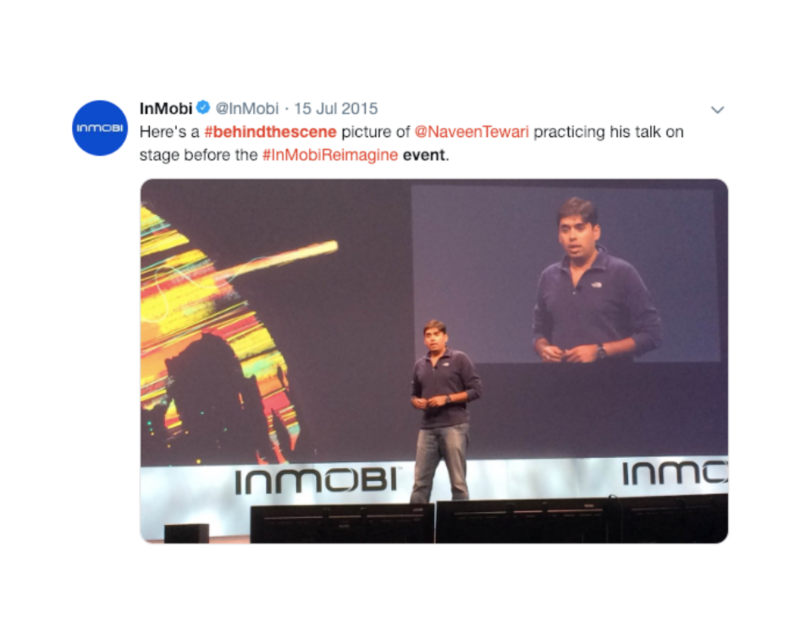 NASSCOM and TiE are two beautiful examples of Members Community for Event Success! Run a campaign to invite volunteers! Make it a compelling proposition for them to be excited about an opportunity for your event. Most of the times, volunteers are your own industry professionals who are very enthusiastic to create a network to influence, engage on social media and be the connector among your participants. iSpirt, Hasgeek, TED/TEDx are fantastic examples of Volunteers contributing to market the events. The Buzz! Speakers make the most crucial element of your event success and your marketing success. If you have incredible speakers, that is compelling enough even for most passive participants to register. But don’t stop just getting the speakers! Share about them as part of your content marketing, blogs, social media and even influence them to be an influencer. Here is a snapshot of Suresh Sambadam (Kissflow CEO) sharing about SaaSBoomI event where he is a speaker too! Always be trying 🙂 Sponsor is a great endorsement for your event. When incredible corporate talk about you, it multiples your event marketing success! Time to show your event production/preparation fun/hard work and commitment as behind the scene images/videos. This creates enormous buzz/media sharing and helps you to spread word of mouth, which translates to more registration. Depending on your audience of the event, you have to choose a social network. It may be LinkedIn, Facebook /Twitter /Instagram. A fantastic platform for events! Combine with hashtags, and FOMO campaigns and Influencers, your event will draw a massive participation interest and conversion for registrations. Create hashtags to align with your unique event name/concepts and make it easy for the Twitter audience to discover and share/RT your updates. For the professional audience, LinkedIn and LinkedIn Groups are good! You can update/change your bio to reflect the upcoming event, making it aware to all your connects/active connects. I recommend you join relevant LinkedIn groups much ahead of your event and stay active. 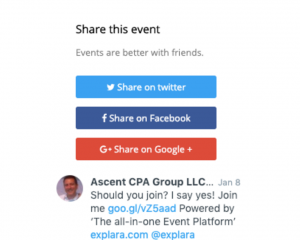 With your event, now you can use the groups to share updates. Note: Too much of anything is never good. 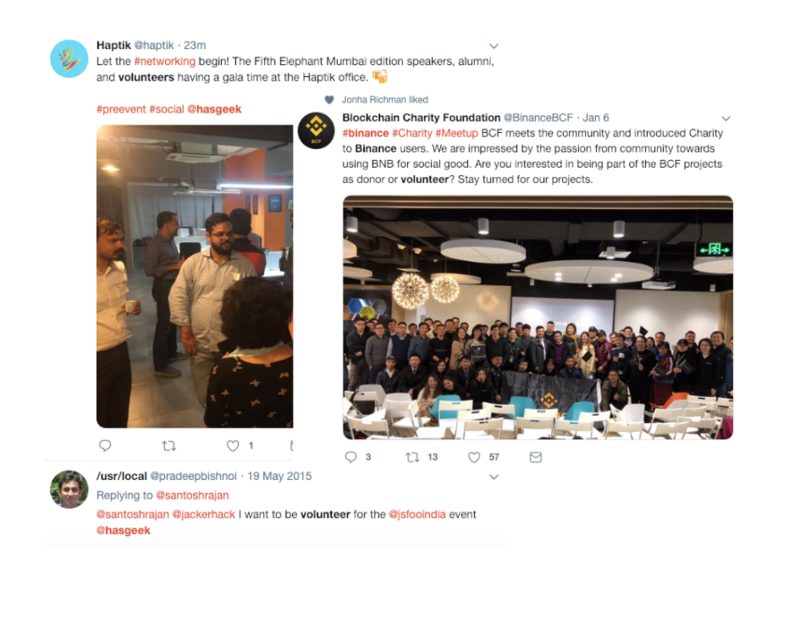 Like LinkedIn groups, if you are part of WhatsApp groups/Telegram groups (popular for Blockchain /Crypto), you can broadcast your event updates. Offer them special discounts. Meetup groups are top-rated among tech events/meet/conferences. 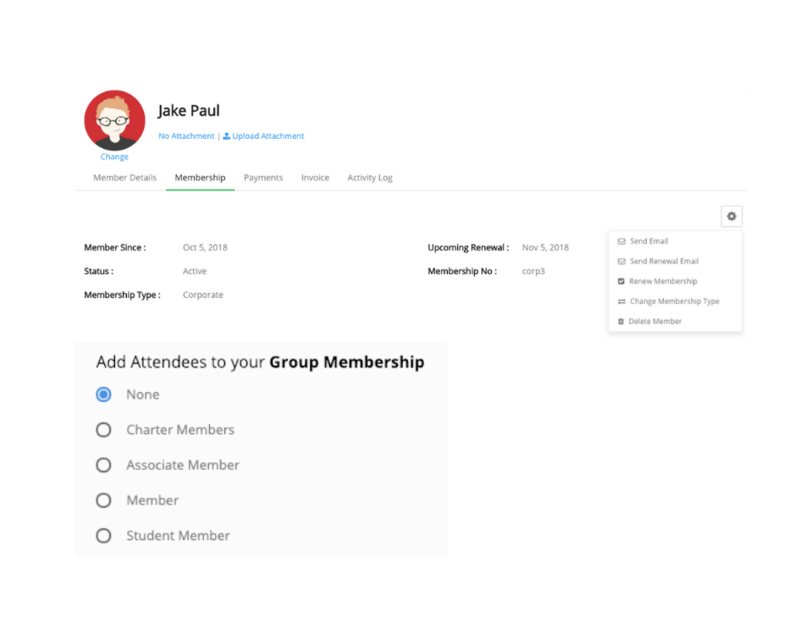 You can join existing groups to promote your event and/or create a group to build an audience and drive the same to your event page on Explara for event day registration. You can even import your meetup group members as a particular set and offer then x% discount for being a member of your group! Invite and create a list of influencers who are genuine, expert in your event topics, and ethical in their work. Engage them in supporting your event and don’t hire /use influencer agency, and it is easy to figure out genuine influencers vs. paid ones. Use your strong connects/friends-friend to establish a set of influencers. Keep sharing them your contents and updates for them to share. 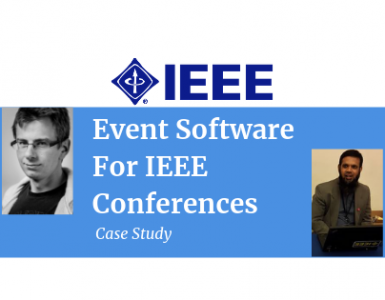 Hosting a large scale conference? I recommend you to create several hackathons, either spread in different units or cities to build the movement/buzz leading to your conference. For instance, if you are hosting a Blockchain conference, how about hosting a hackathon for a contest to select few to join for free? SWSX /The Goa Project and more are the perfect examples of hosting events which select participants and invites them to join upon chosen. You can use this for your conference networking dinner/ private session with speaker/etc. Use discount to convert early interest to registration. Discounts like an early bird, bulk for group /team booking are great to generate buzz. With Explara, you can use the discount code, bulk discount for certain types of tickets/registrations. Create affiliate links for all your stakeholders, i.e. sponsors, speakers, partners, etc. Give them unique URL/links using which you can know how effective promotion/conversion for each link. Either you can pay these affiliate or offer them in-kind partnership, i.e. free tickets for each conversion. With Explara, you can create such an affiliate/channel partner for one or more event and let each affiliate manage their own sale (online/offline). Engage your branding /media agency /photographer etc. 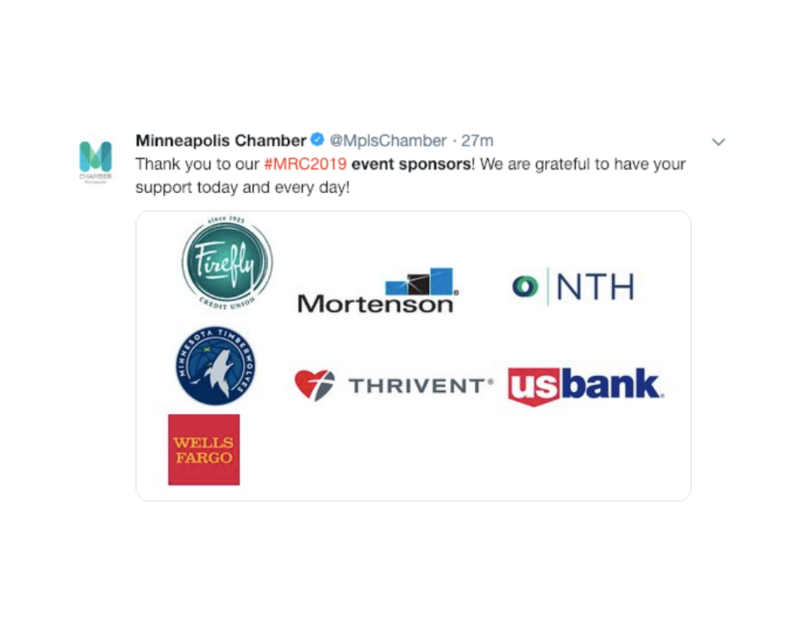 to cross promote for the event marketing partnerships. With Explara, you can measure this by using an affiliate/custom tracking link to measure conversions. 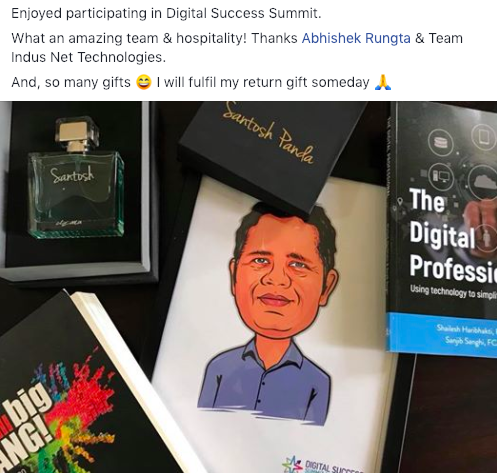 You can leverage social media to organize a small contest which will be about your event and can offer goodies to people who will win the contest. Let winners announce /share their participation. Or Give away the goodies after the event and creates a massive social media appreciation about your endeavours. When the user buys ticket/registers, on the thank you/order confirmation page, let them share /tweet that they are going and include a hashtag to the registration page. Engage your local press/media/blog to post guest articles/industry related articles with a link to your event page. 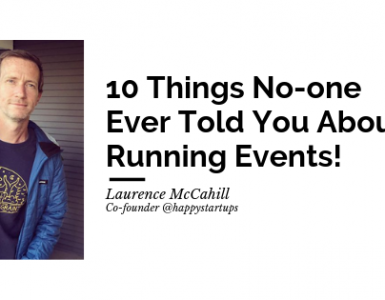 Don’t publish this as a press release, instead use smart content associating with your event. Create text videos by converting your blogs or event contents to quick video. You can use Typito and Rocketium for such video, easy to produce and impactful. Make your event-day an unforgettable experience! Generate the best impact and takeaway for each participant. This is crucial for your next event. You should post short live clips of your event to make an excellent online presence. You can make use of periscope or Facebook live. When you post such videos on Facebook or any other social media platform, you will get excellent views, and this will increase in your event brand. You can make use of Twitter to make live updates about your event. You can share some quotes from Influencers, and you can even leverage Instagram to post your event photos. Don’t forget to add your event’s hashtags to make your event a big splash. You can ask event attendees to post questions media during the event, and you will answer it live on stage. Allow gamification like scan a QR code to get partner/sponsor benefits. Gamify social media feed to increase content sharing. All these add to your event engagement and value for your participants. Networking is a fundamental expectation for your B2B events/business events. If this is done well, you are guaranteed to have a successful series of events! This is an early sign of a community getting built around the event. Don’t let the momentum be transactional! Build & grow a relationship with your participants. 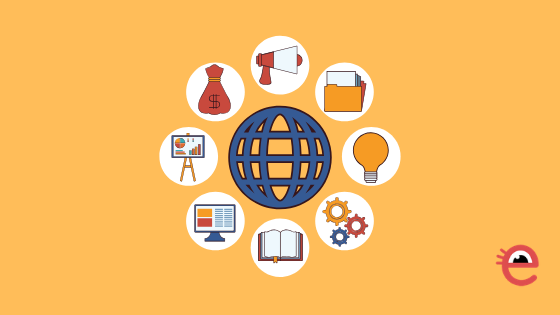 Share all the learnings such as speaker slides, videos, presentations with your participants. Upload them in your website and/or storage links that can be offered as exclusive to the participants or some of those in the public domain. Share all the event photos, tweets and special moments with your participants. Send a survey to gather feedback, collect responses to measure the effectiveness of your event. This is a great way to assess your participants ROI from the event. This is very useful to plan your future events. I recommend you not keep any of your participant data in XLS files. Use a contact management software to create a list and/or tag each set of the participant (by an attendee, sponsor, etc.) and enrich each contact using tools like Clearbit/FullContact. With Explara, you have contact management software to build your contact database for your future events too. 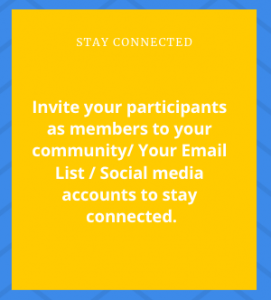 Invite your participants as members to your community/ Your Email List / Social media accounts to stay connected. Are you ready to scale your event to grow organically? Create your account for Free on Explara for your events. Awesomeness!